Andrew Sullivan, Technical Marketing Engineer at NetApp, introduces the delegates to the company’s efforts in DevOps and in the open source community. 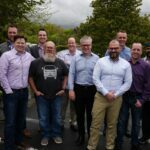 NetApp has had an OpenStack team since 2011, but over the last 18 months have expanded that into an open ecosystem team. Puppet, Chef, OpenStack, Jenkins, containers, Kubernetes all are managed in that team. This is all organized under thePub, NetApp’s effort to enable developers and operate with best practices in the open.